Cray's second album, fairly straightforward electric blues but there are some moments where it gets a little funky or changes things up. I'm sure a lot of people would argue that he was just hitting his stride here and only got better, but I like the fact that the album is devoid of some of the dated 80s production elements on the next couple LPs. While that type of thing doesn't really bother me on say a synthpop album, it doesn't quite work the same way with this type of music. ^I had the privilege of seeing him live once it was an incredible show. What struck me was how good he was at both singing and playing the guitar. ^I can imagine his live show would be great. And yeah, being able to sing well (and write good songs) in addition to playing guitar is good. The contemporary wanker type blues guitarists that can barely sing don't really do much for me. Been doing a little bitching in the what hip hop are you listening to section , but was bumping this the whole time . 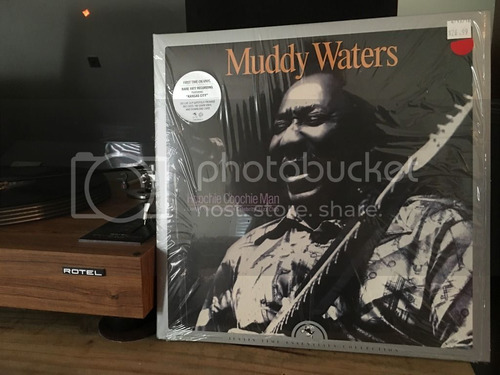 Muddy Waters - Hoochie Coochie Man Live At The Rising Sun Celebrity Jazz Club 2lp RSD release . I've recently ( within the last 5 years or so ) found an appreciation for live records . Especially Jazz , blues , and soul . I used to shy away from live recordings like they carried sickness . But after listening to this and records similar in style and quality , I can't figure out why . Definitely a great record store day release . The sound isn't perfect on this , but it makes you feel like your there . Plus it's pressed up on heavy vinyl too , which is almost always a plus for me ..
Edited 1 time(s). Last edit at 05/29/2016 11:05AM by jaybrown. Played this recently after not having heard it in awhile. I always look for JLH albums but come up empty handed because the ones I find are typically in rough shape and the store wants too much for them. At any rate, this is good one, but I have no idea how it compares to his catalog overall. It's definitely got some unsettling moments to it.